SUBHEAD: As radiation from Fukushima Daiichi heads our way, our governments turns a blind eye. 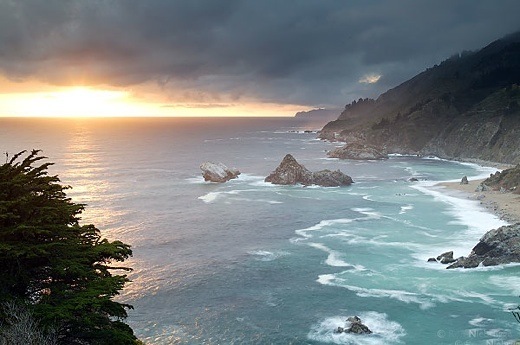 Image above: An ominous sunset along Big Sur, California. From (http://www.wildnatureimages.com/Big%20Sur%20Coast%202.htm). Researchers from Hopkins Marine Station of Stanford University and the School of Marine and Atmospheric Sciences, Stony Brook University, released a study May 28th, 2012, that showed that all 15 samples of Pacific Bluefin tuna caught off of San Diego in August 2011 showed indisputable signs of radiation contamination emanating from Fukushima. Video above: Checking out radiation in Furnace Creek in Death Valley, California after the rain. In original article. From (http://youtu.be/nQCTQ_WAsE4). “The lesson to be learned is that both the U.S. and Japan suffer from very lax regulation, a too-cozy relationship between nuclear regulators and the industry they are to regulate,” Hirsch said. “This can lead to dangerous outcomes. This was not unanticipated. Yet the need for immediate information was undeniable. These radionuclides and buckyballs make up the goo inexorably crossing the Pacific, which may just have begun to impact our shores. Yet not a nickel of state or federal money is spent monitoring it. We are on our own in this Fukushima nightmare. • This report was originally published at EnviroReporter.com. Contact the writer and view additional materials at EnviroReporter.com. You really expect your government to help? Come on! Wake up! Didn't you notice that your government has been promoting killing people, rather than saving them. They have no solution for overpopulation. They don't want to hear about re-distribution of wealth. They are promoting useless and even harmful inoculations. They are promoting medications instead of prevention. They are idealizing single motherhood. They are idolizing and strongly supporting homosexuality as opposed to normal family structure. All of this is for reducing the population. Fukushima is a blessing for them. Time to wake up! Granted you are right. This is just an updated reminder to keep people on their toes. We are on our own and hopefully will help each other.